Accidents between motorcycles and other vehicles account for over 56% of all motorcycle fatalities. A major factor in these accidents is the motorist's inability to see the rider. Additionally, in a car, the structure of the car provides safety to the driver. In motorcycling much of the safety comes from the clothing the rider wears, which needs to help prevent or minimize injury, protect the rider from the elements, draw the attention of other motorists and make a desired fashion statement. Motorcycle riders on long trips also need a way to charge their cell phones. Speakers and a microphone, integrated into the jacket collar, would allow the rider to make hands-free cell phone calls or play music when they arrive at their destination. Because motorcyclist riders are exposed to the elements, on cold days a heated jacket would increase rider comfort. MiaSolé created a solar powered motorcycle jacket that improves rider safety by using electroluminescent light elements . These light elements are powered by a battery charged using a flexible, lightweight, powerful thin-film solar panel incorporated into the back of the jacket. 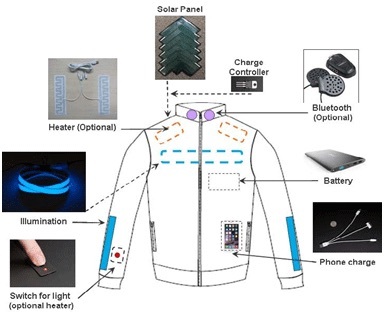 Thin-film solar cells provide a couple of unique advantages for wearable solar jackets: their flexible nature allows for a panel that can bend and move with the rider without constricting movement and their rectangular shape allows them to be made into interesting geometric patterns that can enhance the look of the jacket. The MiaSolé jacket comes with a battery pack that can be removed for additional portability and charging versatility. The jacket also provides several other features such as cell phone charging, Bluetooth-capable speakers and an optional heated collar for cold mornings. The hardware layout of the jacket is designed to be as functional and non-intrusive as possible. The solar panel and lighting elements are sewn into the back of the jacket. The optional Bluetooth speakers are located in the collar to facilitate hands-free phone calls or listening to music. The heaters are located inside the jacket, near the shoulders and neck. The battery pack is located in an inner pocket, and the phone charging cable is located in an outer pocket, allowing a rider to simply plug in their phone and place it in the pocket to charge. The charge controller and inverter are small enough to be hidden in the lining of the jacket. The switches to operate the lights and/or heater are located in the lower right-hand sleeve, to allow the rider to operate them with the left hand so the right hand can remain on the throttle of the motorcycle. The MiaSolé motorcycle jacket increases rider safety by making the rider more visible to other motorists. The illuminated panels on the jacket do not require an external light source, such as headlights, to activate them. The can be seen from greater distances as well as from the side when traveling next to a vehicle, offering a huge advantage over reflective tape, which can only be seen head-on. The other features such as cell phone charging, integrated Bluetooth speakers and a heated collar combine with the safety lighting to make the MiaSolé motorcycle jacket an ideal piece of gear for any rider.